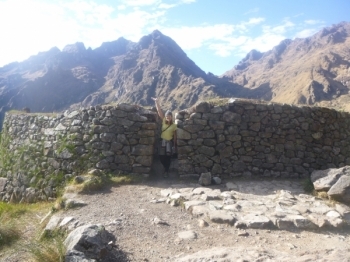 Home » Inca Trail Stories » Such a lovely challenge! The Inca Trail was a real challenge but absolutely worth it! The hikes and views were amazing (especially day 3!) the people very fun (hikers, guides and porters) and the food fantastic (thank you Chef!)!. It was on my bucket list for a while and I couldn't have been happier to have completed it! I definitely consider it as the highlight of my Peru travels! The arrival in Machu Picchu was very early but so beautiful - a true reward for the past hiking days! . I am convinced that it is the best and "most real" way to visit Machu Picchu - A MUST ! !.